It wasn't long ago when we had a look at ATI's X800 Pro – its initial competition was with NVIDIA's GeForce 6800 GT, which proved to be a little too much for ATI's part to handle. 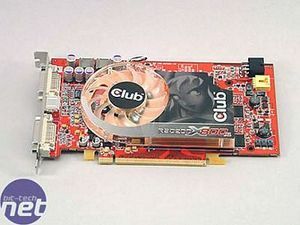 There were many issues with yield on ATI's R420 and R423 graphics processors – many of them were not meeting the grade for them to be capable of running at the somewhat ambitious 520MHz that the Radeon X800 XT Platinum Edition was clocked at – and we never really saw a great deal of the 'Phantom Editions' in stock. NVIDIA were plagued by early problems getting their GeForce 6800 Ultra video cards on to the virtual shelves of the top (r)etailers in enough volume to cope with the demand in that respect, so ATI were not alone in struggling to cope with the massive demand for the video cards that were released back in Spring 2004. Come December, ATI gave up the ghost with the R420 and R423, releasing two new graphics processors; namely R430 and R480. These were both native PCI-Express GPU's that basically refreshed everything from the missing-in-action X700 XT, right up to the X800 XT Platinum Edition. There were five new products released, Radeon X800, Radeon X800 XL – both based on R430 – Radeon X850 Pro, Radeon X850 XT and finally, Radeon X850 XT Platinum Edition; these SKU's were based on R480, with the X850 XT and X850 XT PE using a dual slot cooler. Confused yet? Today, we are looking at three Radeon X800 XL's, a part that is said to deliver similar performance to NVIDIA's GeForce 6800 GT, but costing considerably less. The default clock speeds for the reference design are 400/1000MHz, and the cards do not require an additional power connection. It looks to be an interesting part on paper, but for now, lets have a look at the contenders. 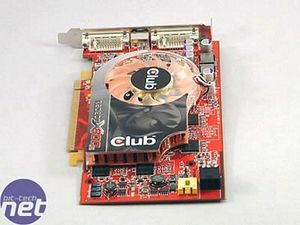 As we have mentioned before in our Mid-range PCI-Express shootout, Club3D are the only manufacturer worldwide to offer video cards from ATI, NVIDIA, S3 and XGI. Its X800 XL is slightly different to the reference design in many respects – the first thing that is worth noting is the additional power connector that Club3D have chosen to implement in to their board design. This should prove to help with overclocking the video card beyond its default clock speeds. The heatsink design is a familiar sight – it is the same design that was used on the ATI Radeon X800 XT Platinum Edition, and the majority of the Radeon X800 Pro's that we have seen. There are no complaints with this design at all – it was no surprise that most of ATI's board partners chose to keep the reference design on their X800 Pro and X800 XT Platinum Edition implementations, since it's a quiet and proven design. Club3D have changed the fan aesthetics slightly – they've used a clear fan which is lit by four white LED's – we think that white is the new blue, and you all remember how popular blue was! 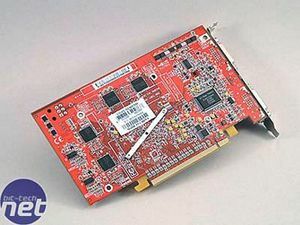 The other interesting aspect of this implementation of the Radeon X800 XL is the fact that the board features ATI's Rage Theater chip, meaning that the video card has VIVO capabilities - in other words, the video card is capable of video encoding and decoding. 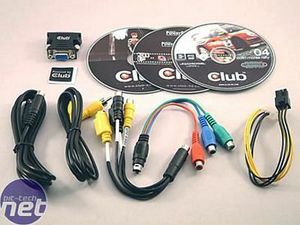 The video encoder converts images from DVD's, games, and the Windows environment into all NTSC and PAL formats to allow for TV connectivity. Essentially, the video decoding part of the chip does the opposite, as it converts NTSC, PAL and SECAM formats into high-quality, low noise digital video. You will have also noticed the yellow connector next to the 6-pin power connection – this is an audio output for the Rage Theater chip. There are eight 32MB BGA memory modules, rated at 1.6ns or 600MHz (1200MHz DDR) in layman's terms. They are not cooled, but running well under their specification, which means that they should prove to overclock fairly well. The back plate connections will please TFT users, as there are two DVI connectors. However, this will not please consumers with two analogue monitors as there is only one DVI to VGA converter included in the bundle, something that proves to be a slight disappointment for a reasonably high-priced video card. 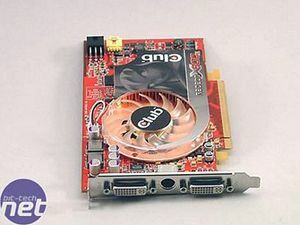 If BFGTech can manage to include two DVI to VGA converters with its GeForce 6600 GT OC video card, we are sure that Club3D can include an extra one in this package. 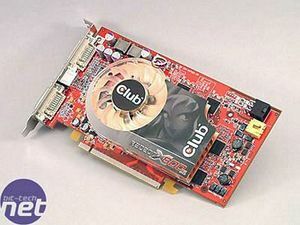 There are three CD's included in the bundle: one contains the video card software, including display drivers and manuals for their ATI Radeon-based products – there are also movies and ATI demos included on this disk – much like Club3D's X700 Pro utility disk. There is one game title included: Colin McRae Rally 04 – while this is not the current version of Colin McRae Rally, it is a good deal more attractive than WWF Panda Junior In Africa; the game that was included in Club3D's X700 Pro bundle. Finally, there is PowerDVD 5 and PowerDirector 3DE on the final CD in the bundle. An interesting thing that we feel is worth noting about Club3D's software bundle is the fact that only the cost of the media (i.e. the CD that the software comes on) is actually kept by Club3D, all other monies are sent to charity. Bravo!